Quinoa is also known as the mother grain and and was considered sacred by the Incas. Quinoa is grown in the Andres and the harvest usually begins in March. “While no single food can supply all the essential life sustaining nutrients, quinoa comes as close as any other in the plant or animal kingdom.” Stated by Philip White in a 1955 article on quinoa. Quinoa is referred to a pseudo-cereal because it is cooked and eaten similar to a cereal grain and has similar nutrients, however it is more closely related to beets, chard, and spinach. The leaves can also be eaten. Quinoa is coated in bitter saponins that must be rinsed away before preparation. A half pound of quinoa seed can plant a full acre and create 1,200 – 2,000 pounds of new seeds each year. It is drought resistant and has been named a super crop by the United Nations for its potential to feed the world’s hungry. 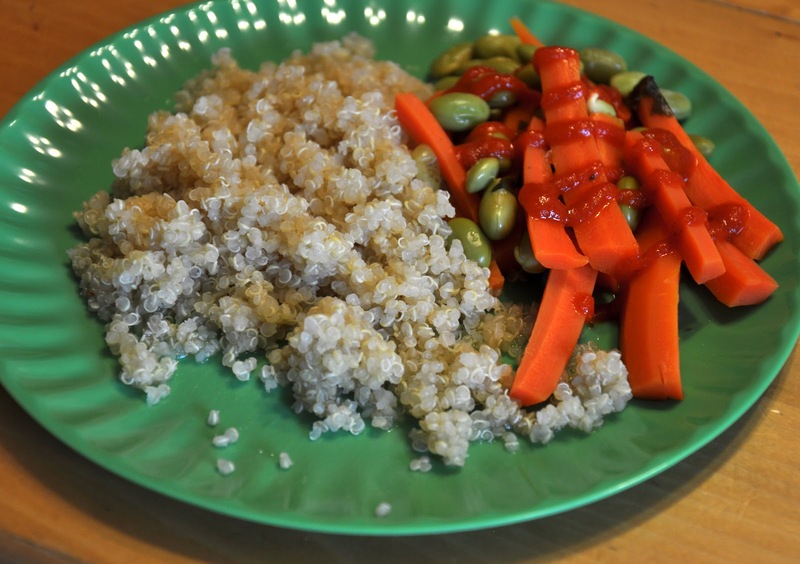 Quinoa is the only complete protein grain and therefore will make you feel fuller longer. Quinoa is also gluten-free and therefore a great alternative for those with gluten intolerance. It may be helpful for those with diabetes as well. As far as cooking quinoa, it is usually ready within 15 minutes or less. Always check the directions on the package though. It comes in a variety of nice colors too – white, red, and black. Here is my Quinoa & Steamed Vegggies. The veggies serves two, but I am always left with plenty of quinoa. 1. Rinse quinoa. Cook quinoa in small sauce pan. While it simmers on low for 15 minutes, prepare veggies. 2. Peel and two medium slice carrots. Place in a small saucepan with just enough boiling water to cover carrots. Add fresh ground pepper and a few squirts of lemon juice. Turn to low, cover, and simmer for 5 minutes. 3. Add frozen edamame beans. Cover, simmer for 10 more minutes. I added a nice helping of Sriracha as well. I cannot get enough of this spicy sauce as of late. This dish is tasty warm or cold.